Cantaloupe is a low-calorie fruit that can be included in any MyPlate healthy weight-loss meal plan. But eating too much cantaloupe to lose weight can drain your energy, hinder weight loss and lead to nutrient deficiencies. Adding protein-rich foods to cantaloupe can help boost satiety for overall calorie control. Because cantaloupe contains lots of water, 1 cup of cubed cantaloupe contains just 54 calories. Cantaloupe's low calorie content makes it an ideal choice during weight loss. Honeydew melon, strawberries and apples are also lower-calorie fruits that are beneficial when you're trying to lose weight. Examples of higher-calorie choices include canned fruits with added syrup or sugar, dried fruits, grapes and bananas. Adding cantaloupe to your diet is effective for weight loss if your overall calorie intake is less than the number of calories you burn throughout the day. Reducing your current intake by 500 calories daily will help you shed about 1 pound weekly. Total intakes of 1,200 to 1,600 calories daily are often effective weight-loss diets for adults, according to the National Heart, Lung and Blood Institute. The amount of cantaloupe or other low-calorie fruits you should eat daily to effectively shed pounds depends on your weight-loss calorie requirements. The Dietary Guidelines for Americans 2010 suggests eating 1 cup of fruit daily when consuming 1,200 calories a day and 1.5 cups of fruit each day when following 1,400- or 1,600-calorie weight-loss meal plans. 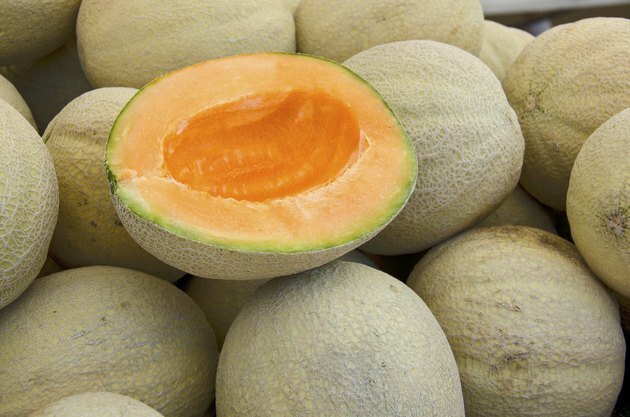 A 1-cup equivalent of fruit is 1 cup of diced or balled cantaloupe, notes ChooseMyPlate.gov. Protein helps your body burn extra calories throughout the day and boosts satiety more than carbohydrates, the predominant macronutrient in cantaloupe, according to a 2008 review published in the "American Journal of Clinical Nutrition." Therefore, eating protein with cantaloupe is beneficial when you're trying to lose weight. Examples of healthy, protein-rich foods to choose from include lean poultry, nonfat cottage cheese, seafood, egg whites, low-fat plain Greek yogurt, low-fat milk or soy milk, seitan and tofu. National Heart, Lung and Blood Institute: How Are Overweight and Obesity Treated? ChooseMyPlate.gov: What Counts as a Cup of Fruit? Can Eating Too Many Apples Hinder Weight Loss? Does a Cup of Spinach Every Day Help Weight Loss?